1. Wash the rice and cook in boiling hot water in 5 minutes. Filter and cool. 2. Peel the onion and chop it very finely. 3. Take a bowl. Put in the meat, add egg, salt, grounded pepper, paprika, chopped onion, and mix them together well. 4. Finally add the rice too and mix. 6. To cook the meatballs boil the 750 ml tomato juice, add celery, salt and 2 slices of green pepper. Put the meatballs into hot juice. Boiling them in 30 minutes. 7. Remove the meatballs to a bowl. Throw the celery and green pepper off. 8. Stir the flour with a little water smoothly in a cup. Pour it into the tomato sauce and boil it for 3 minutes. Add the sugar too, boil with it still 1 minutes. Power off the heating. 9. Place the meatballs to the sauce. This food usually serving with diced cooked potato or only with slice of bread. 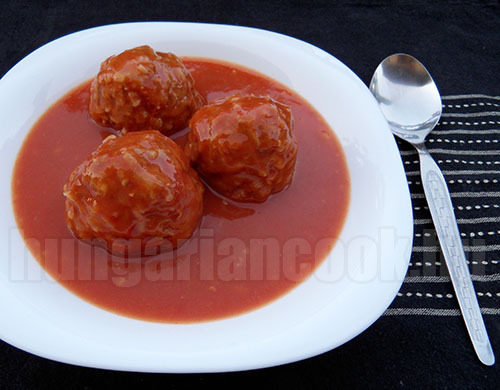 0 megjegyzés ehhez: "Meatballs in tomato sauce - Hungarian version"